this is the kind of lamp you said is good right? That's actually not a lamp in and of itself, it's just the "hood" or "fixture." It holds the bulb. That's quite large though for such a small tank. Since you only need a very low wattage house bulb for light (meaning you don't need a reptile light for heat), I would size down to the 5.5" dome. It'll save some space. You can certainly use the larger one but it may look bulky on the small tank. Birby got a 10 gallon enclosure for her wee Sphaerodactylus. Birby uses the hood/fixture with a low wattage bulb to provide heat for the small gecko. The Fluker's 8.5 inch diameter fixture spreads heat out over the 10 gallon pretty well and also lets Mocha have a cool end. I even use 10 inch diameter hoods over some of my 10 gallons. Since heat rises a 5.5 inch diameter hood would allow too much heat to escape into the room. Last edited by Elizabeth Freer; 10-12-2018 at 06:35 AM. Birby got a 10 gallon enclosure for his wee Sphaerodactylus. okay so as we were discussing by email i had met ron at the baltimore reptile expo a couple weeks ago. i showed him a couple pics of mocha because i was told by other vendors that he is the guy to ask about the more uncommon geckos. he took one look at her and he straight out said that she is not a cuban ashy gecko. over the couple of weeks i have been in contact with the company over facebook trying to get good photos of mocha so they can properly identify her. last night they said that they believe that mocha is sphaerodactylus macrolepis. blue eyes because they can see that she has blue eyes. I googled images of sphaerodactylus elegans and s. macrolepis - both came up with photos of many patterns, and some with no patterns, that look just like Mocha. They both seem to have the common name of Ashy Gecko. 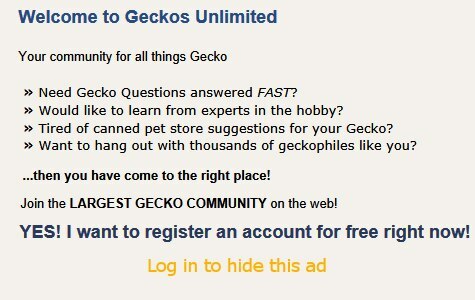 Maybe somebody here who's more schooled in the micro geckos can check into it further for you! I am so glad that Mocha is doing well, and that speaks a lot to your dedication. shes really hard to find in the tank with all the stuff inside with her but she poops everywhere so i know shes eating. i started giving her fruit flies every once in awhile along with crickets because this other guy that i met on discord who keeps dwarf geckos said that she would eat them. i dont know if she is actually eating them or is they just escape from the lid but she is pooping a lot. I think you might have to be very careful with the sand/eco earth if you are feeding crickets. She could grab a mouthful of substrate while going after the crickets and get impacted. Are you pulling out any crickets she is not eating? If left in there, they can bite her and really cause some problems, so do try to make sure that she is eating them, and not leave them in there loose if she is NOT eating them. Hopefully Elizabeth or Aliza can let you know if the above would be an issue. I can't tell from those photos just what color Mocha's eyes are. You're doing a great job keeping Mocha happy! She looks well-fed!!! It's a good thing that she's hard to find. That means she's safe. When you feed Mocha fruit flies use that cloth underneath your fine mesh screen top. That will prevent the flies from escaping. I'd wait to change the substrate from paper towels (?) until Mocha eats her crickets totally out of some feeding container or bowl. Just like Eileen says, it's super easy for any gecko -- large or small -- to gulp a mouthful of substrate when they "dive" for a cricket. Then the gecko chokes to death! That happened to one of my geckos. Eco Earth comes in fine coco fiber much like peat moss or a much coarser bark-like medium. Playsand is really dusty. It would need washing. also i got a question about magonlia leaves? some people had been saying that they make good leaf litter and cover for their geckos is that true? how do i make the leaves safe for mocha? Thanks for sharing. I've been wondering how Mocha's been doing. She's thriving! A reliable friend who keeps some geckos on leaf litter just told me that magnolia and oak leaves are her favorites. She just rinses them off before using. Mocha should have NO trouble catching her crickets in an empty Lee's 24 ounce betta container or some container of similar height. Place a pinch of ProGutload diet in the container. Add a few crickets and see whether they disappear. One of my juvenile, Mocha-sized, mourning geckos often beats me to her betta container waiting for her supper. Last edited by Elizabeth Freer; 12-12-2018 at 04:03 AM.